“Mysterious Landscape”. Creating an air of mystery draws your viewer into the picture. In a previous article I discussed the way a title is part of your overall communication. You can capture the imagination of the viewer by hinting with your title. Something that cannot be seen, but could be there, draws the attention. The viewer wants to find what is behind the hint. Give them something to look for but don’t show it. Mist is a great device for this. 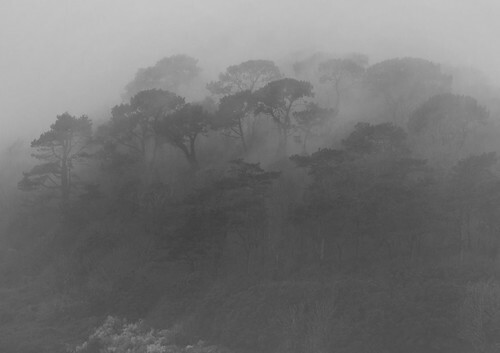 The very thought of a misty forest is primeval and mysterious. Darkness creates a sense of menace if it is done right. Anything with lurking shadows and moody lights creates the sense that something may be there – but not quite seen. This is a situation ripe for the use of under-exposure and low lights. It does not have to be a night scene. However, use of low lights, threatening colours and impenetrable shadows brings on the mystery. Mood and threat make a great combination. Both urban scenes and moonlight landscapes are ideal. I am sure you can let your imagination run wild! I used to manage parks. When we were designing new landscapes we often tried to give an air of mystery. People enjoy going to parks much more if there is a sense of the unknown around the next corner. Walks and views were designed to give people somewhere to go where they could not initially see the destination. So it is with photographs. Create a path, steps, road – anything – that leads somewhere you cannot see. Make the viewer look down the line expecting to see something, which at the end, is not there. An implied destination is a great way to draw in the viewer. One thing humans love to see is a face. We train ourselves from birth to take in peoples faces, understand them, communicate with them. Deprive the viewer of a face and the mystery is on. Masks are great fun. A deliberately hidden face is an immediate mystery. Wide-brim hats in dark places are powerfully mysterious. We have a compulsion to find out who the mystery person is – and it immediately captures our attention. Perhaps the most timeless way of creating mystery is to fool the eye. You know something is wrong and you cannot see what. Your eyes tell you one thing, you feel there is something else. A good illusion has you visually chasing around the image to find the issue. If you create a good illusion you will have a great image based on mystery. There are lots of places on the web to find out about photographic illusions. There are other ways to create a sense of mystery. We would love to hear about mysterious images you have created. Please leave a comment below with a link if you have an image online. Exposure – find out about under and over exposure. This entry was posted in Composition, How to..., Light and Lighting, Shooting specific subjects, Things to try, Tips Tutorials & Techniques and tagged Darkness, Hidden, Hint., Illusion, Illusion photography, Low light, Lurking, Moonlight, Mystery, Night, Night photography, shadows, Under Exposure. Bookmark the permalink.